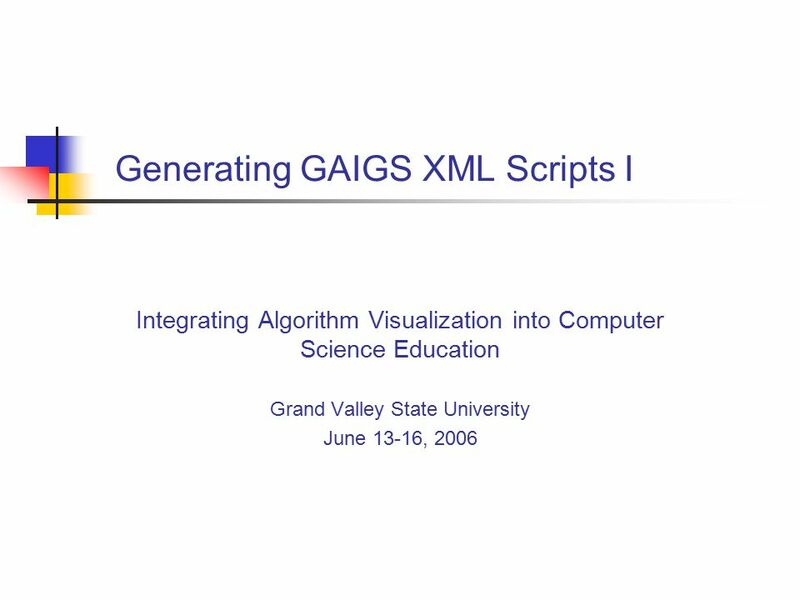 Generating GAIGS XML Scripts I Integrating Algorithm Visualization into Computer Science Education Grand Valley State University June 13-16, 2006. 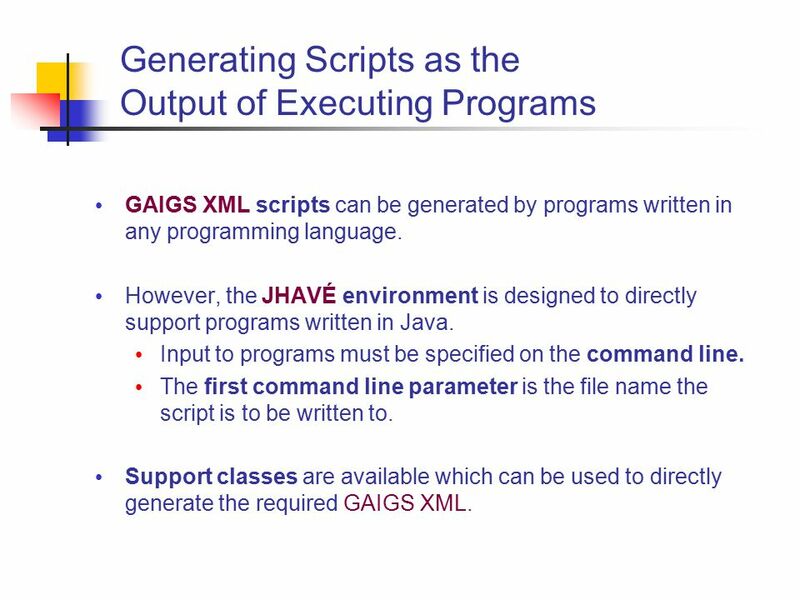 2 Generating Scripts as the Output of Executing Programs GAIGS XML scripts can be generated by programs written in any programming language. 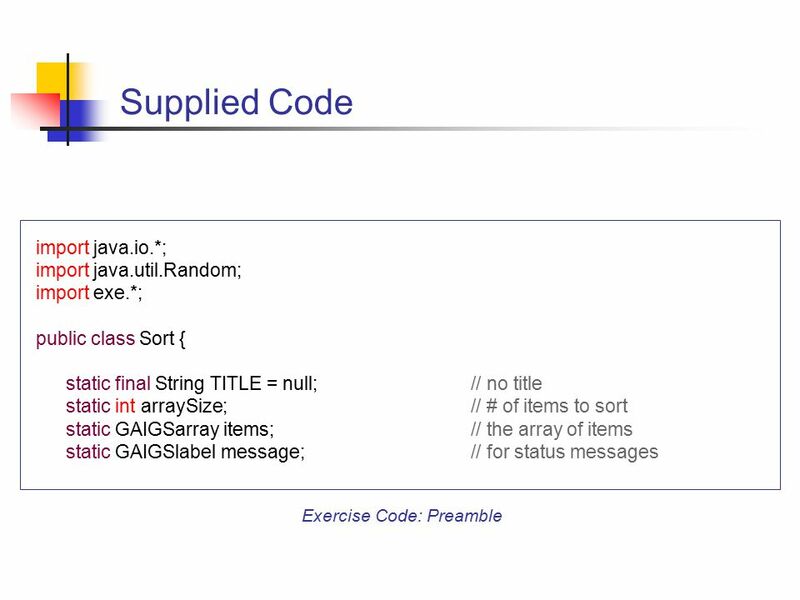 However, the JHAVÉ environment is designed to directly support programs written in Java. Input to programs must be specified on the command line. The first command line parameter is the file name the script is to be written to. 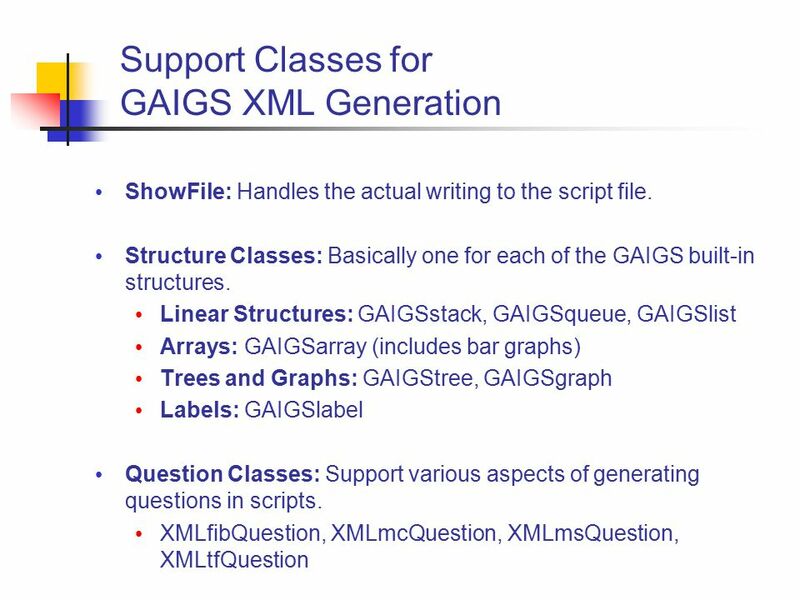 Support classes are available which can be used to directly generate the required GAIGS XML. 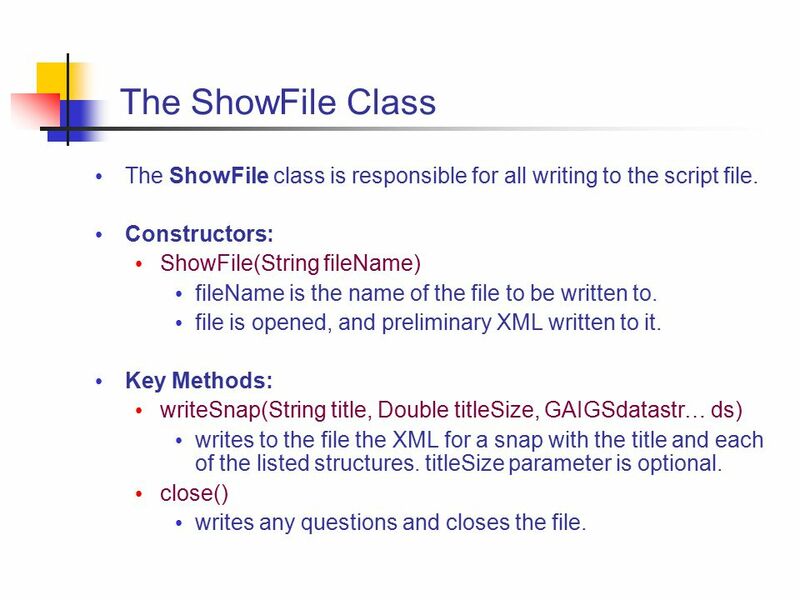 4 The ShowFile Class The ShowFile class is responsible for all writing to the script file. Constructors: ShowFile(String fileName) fileName is the name of the file to be written to. file is opened, and preliminary XML written to it. 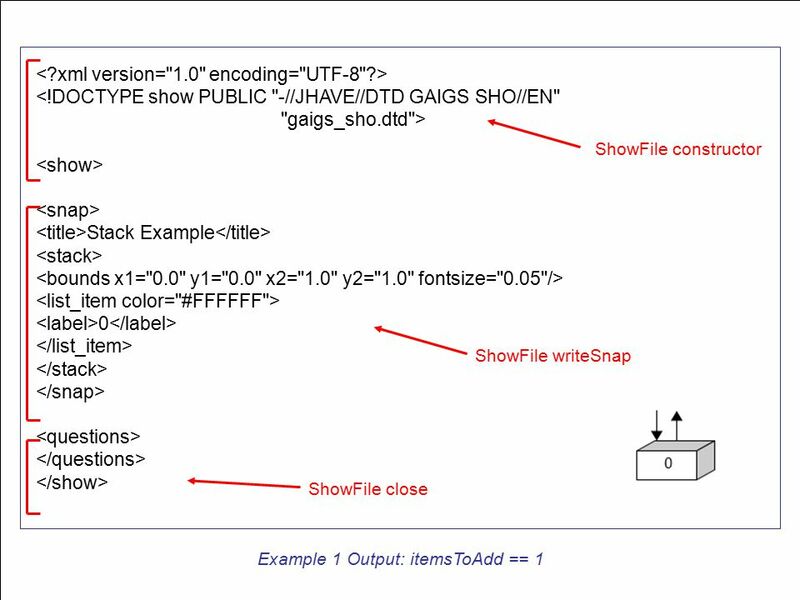 Key Methods: writeSnap(String title, Double titleSize, GAIGSdatastr… ds) writes to the file the XML for a snap with the title and each of the listed structures. titleSize parameter is optional. close() writes any questions and closes the file. 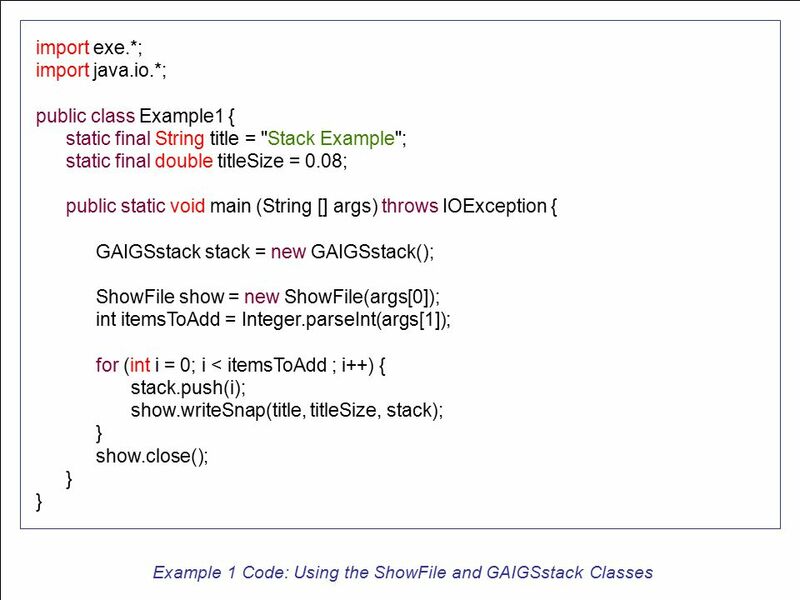 5 The GAIGSstack Class I GAIGSstack functions in the usual way as a stack (with push and pop operations. But also stores color and other information in a way that can remain hidden (if desired) from the client class. 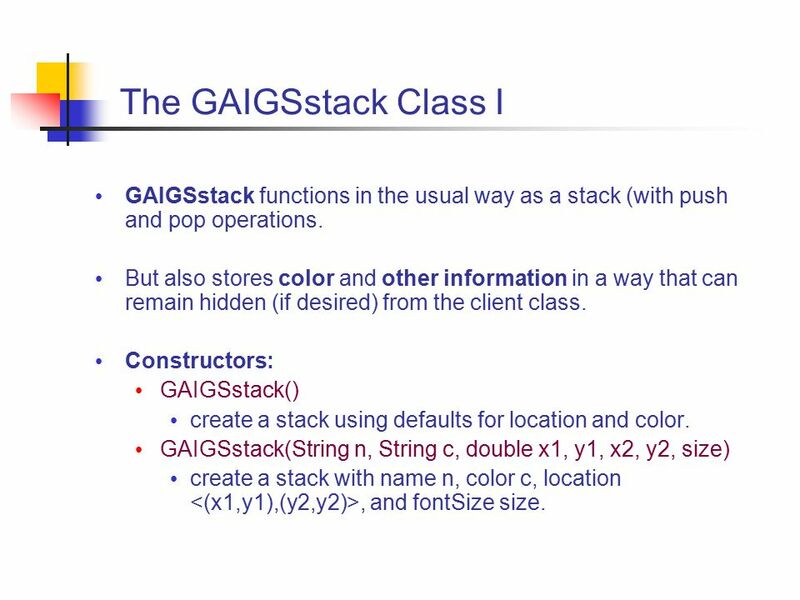 Constructors: GAIGSstack() create a stack using defaults for location and color. GAIGSstack(String n, String c, double x1, y1, x2, y2, size) create a stack with name n, color c, location, and fontSize size. 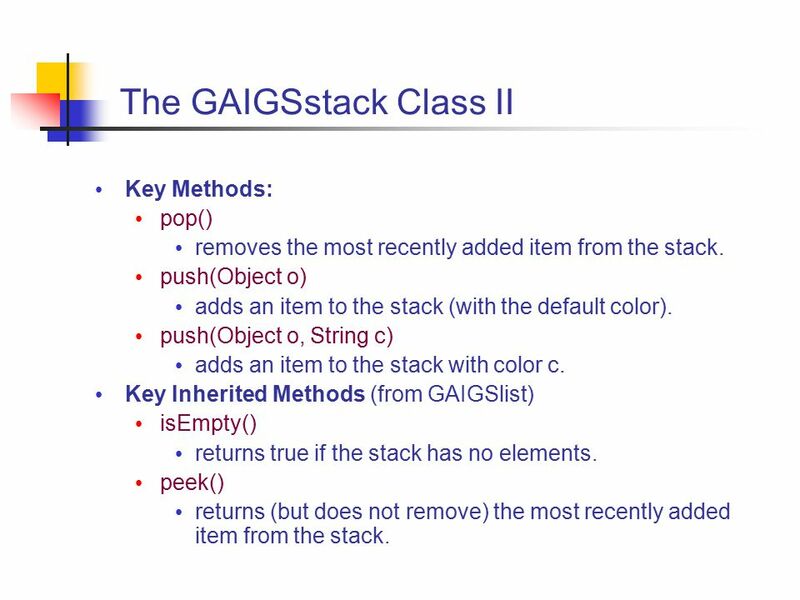 6 The GAIGSstack Class II Key Methods: pop() removes the most recently added item from the stack. push(Object o) adds an item to the stack (with the default color). push(Object o, String c) adds an item to the stack with color c. Key Inherited Methods (from GAIGSlist) isEmpty() returns true if the stack has no elements. peek() returns (but does not remove) the most recently added item from the stack. 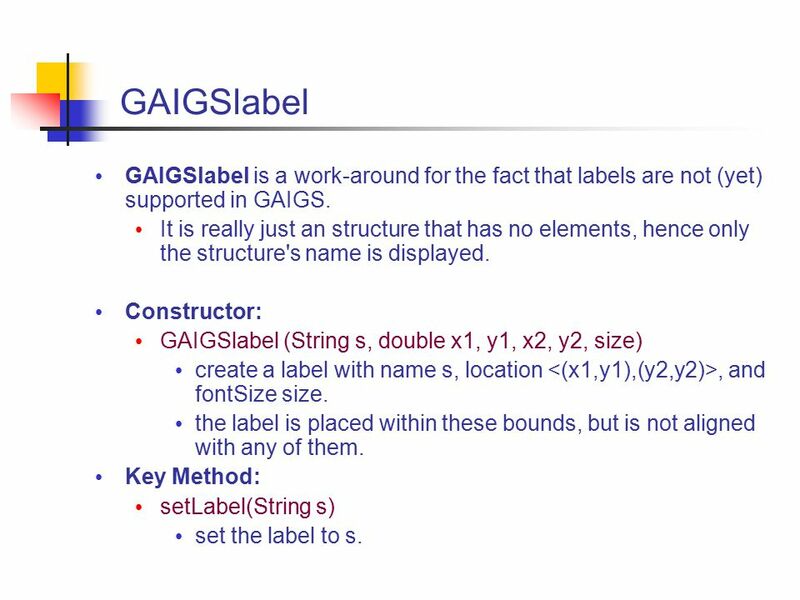 14 GAIGSlabel GAIGSlabel is a work-around for the fact that labels are not (yet) supported in GAIGS. It is really just an structure that has no elements, hence only the structure's name is displayed. 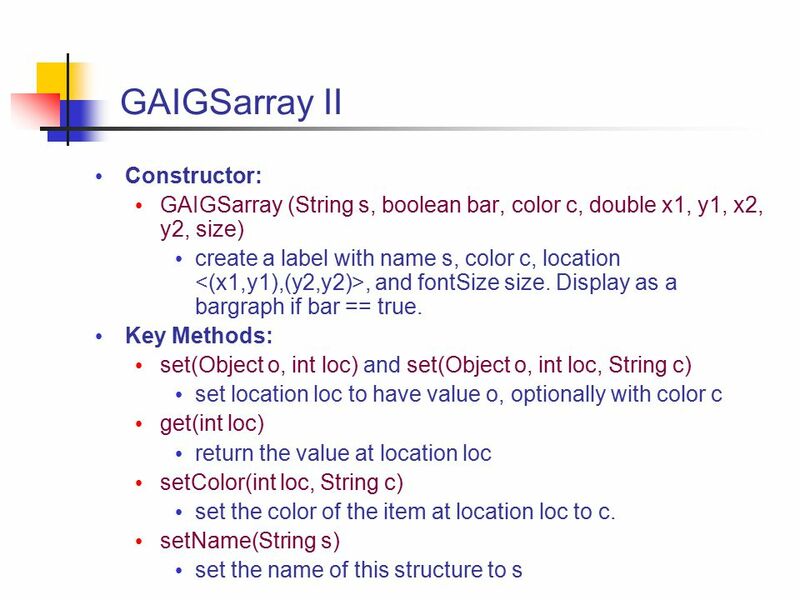 Constructor: GAIGSlabel (String s, double x1, y1, x2, y2, size) create a label with name s, location, and fontSize size. the label is placed within these bounds, but is not aligned with any of them. 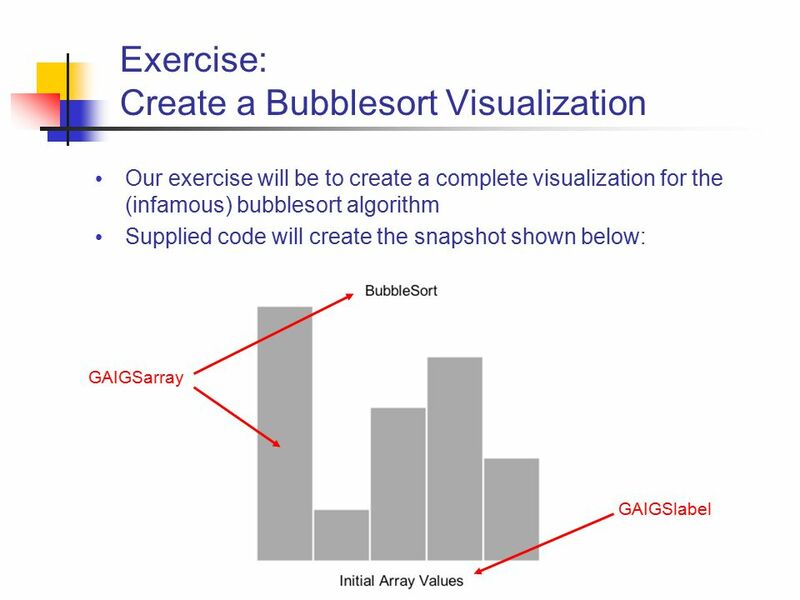 Key Method: setLabel(String s) set the label to s.
Download ppt "Generating GAIGS XML Scripts I Integrating Algorithm Visualization into Computer Science Education Grand Valley State University June 13-16, 2006." Sequence of characters Generalized form Expresses Pattern of strings in a Generalized notation. 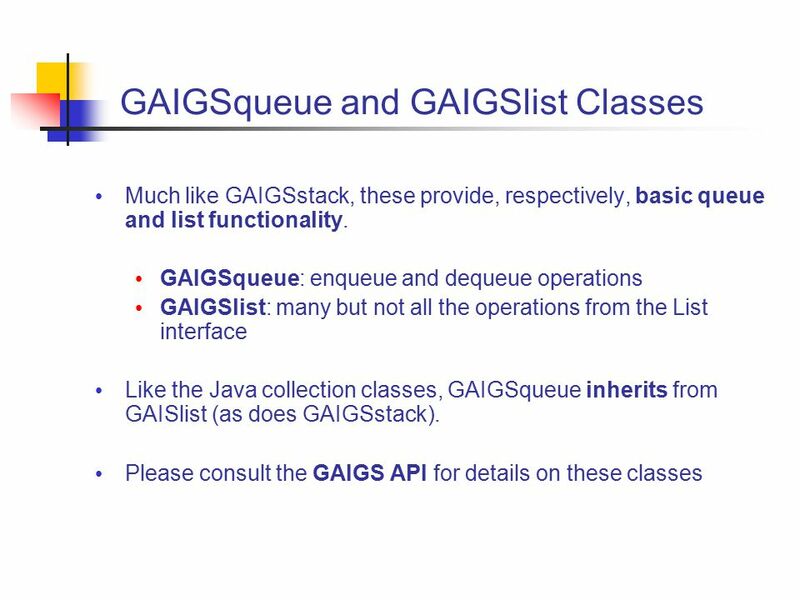 Data Structures1 Basic Data Structures Elementary Structures Arrays Lists Search Structures Binary search Tree Hash Tables Sequence Structures Stacks Queues. 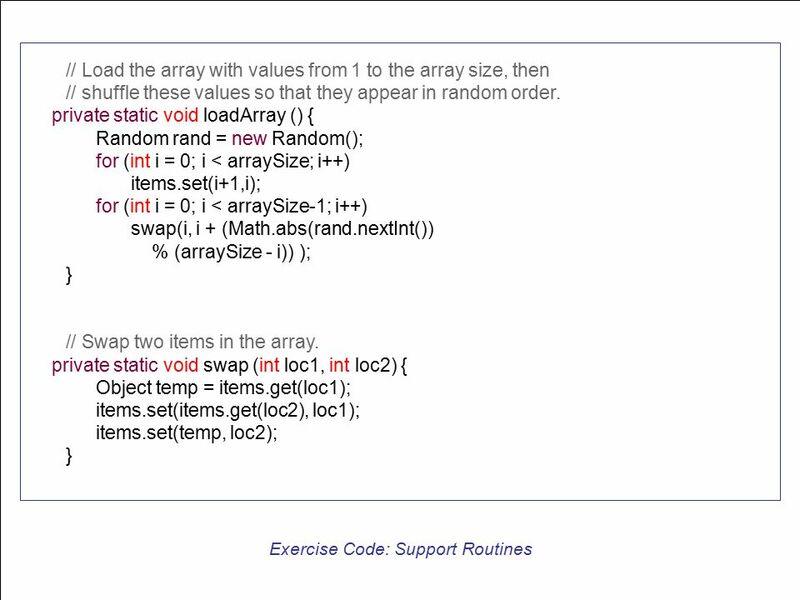 1 Various Methods of Populating Arrays Randomly generated integers. The Queue ADT Definition A queue is a restricted list, where all additions occur at one end, the rear, and all removals occur at the other end, the front. Chapter 5 Queues Modified. 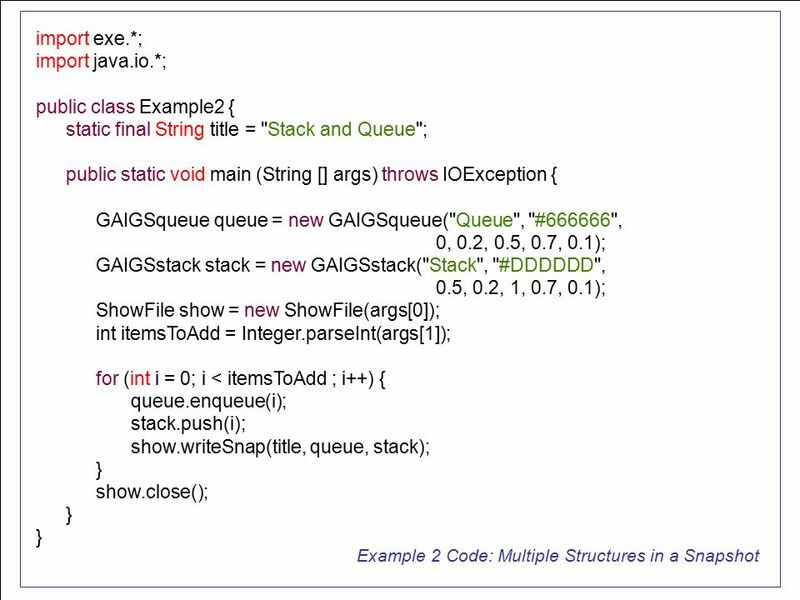 Chapter Scope Queue processing Comparing queue implementations 5 - 2Java Software Structures, 4th Edition, Lewis/Chase. 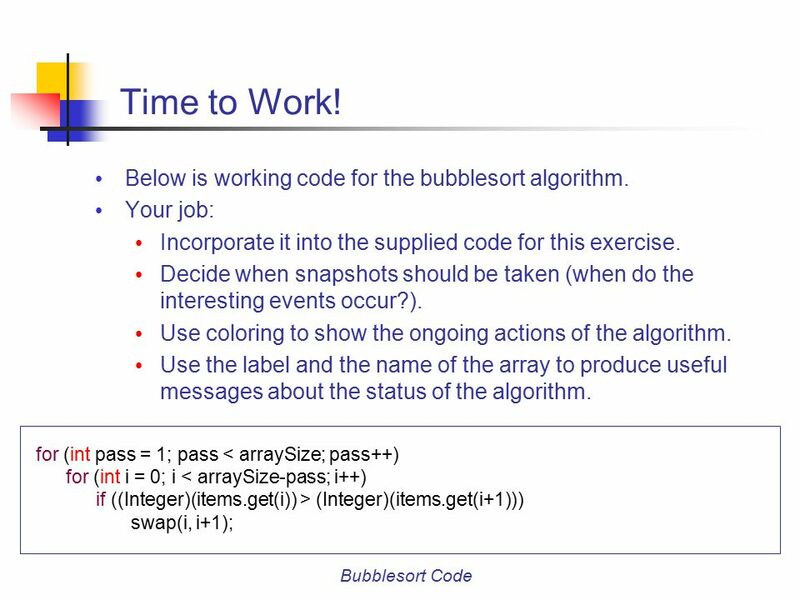 CS 307 Fundamentals of Computer Science 1 Abstract Data Types many slides taken from Mike Scott, UT Austin. Unit 11 1 Unit 11: Data Structures H We explore some simple techniques for organizing and managing information H This unit focuses on: Abstract Data Types. 1 CSCD 326 Data Structures I Stacks. 2 Data Type Stack Most basic property: last item in (most recently inserted) is first item out LIFO - last in first. CS 106 Introduction to Computer Science I 12 / 11 / 2006 Instructor: Michael Eckmann. 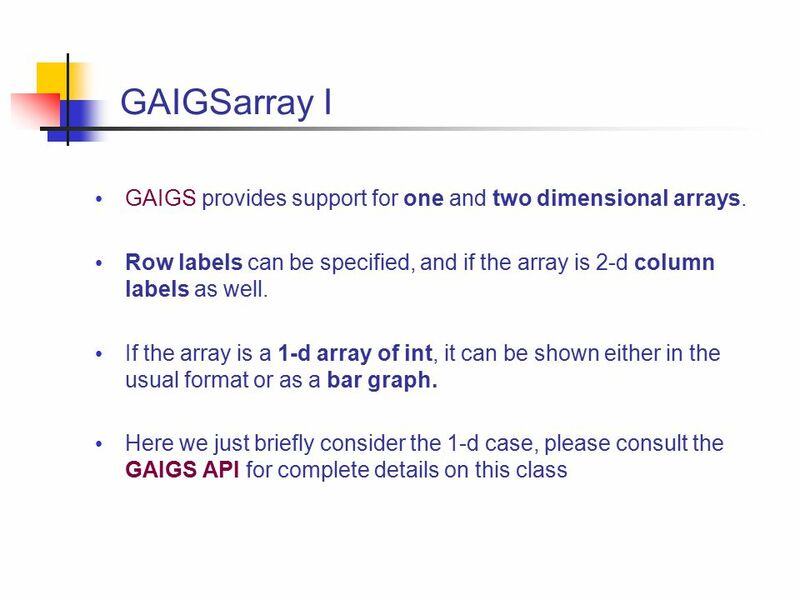 1 Lecture 24 Abstract Data Types (ADT) –I Overview  What is an Abstract Data type?  What is Stack ADT? 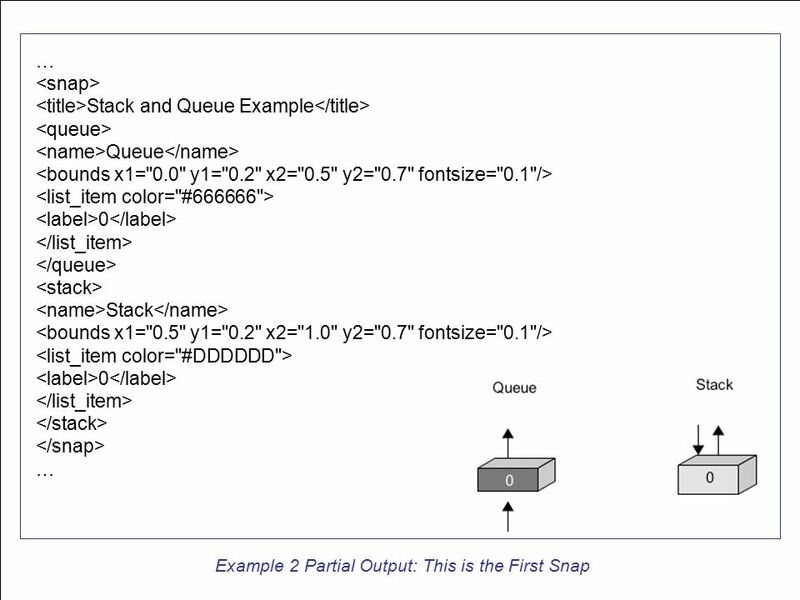  Stack ADT Specifications  Array Implementation. CS 206 Introduction to Computer Science II 10 / 26 / 2009 Instructor: Michael Eckmann. Random (1) Random class contains a method to generate random numbers of integer and double type Note: before using Random class, you should add following. 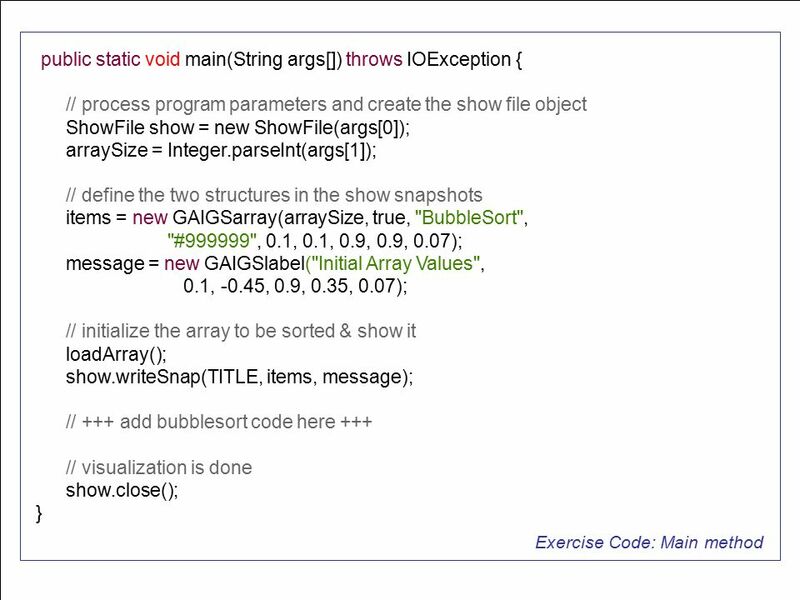 The JHAVÉ Project JHAVÉ: Java Hosted Algorithm Visualization Environment Goal: Development of a comprehensive suite of visualization-based materials for.